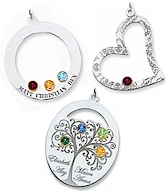 Sterling silver pendants to commemorate Mother's Day or any day you want to make special. 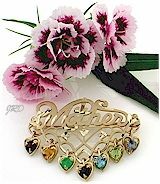 A nice assortment of styles that can be set with simulated crystal stones to represent each member of mother's or grandmother's family. Choose from sterling silver or 14k yellow gold bezels... bezels are the metal that surrounds the birthday stone. Some designs can also be custom engraved with family names. Click here to view selection. Pretty pendants, pins and pendant/pin combinations... a great gift because you don't need to know ring size! The pin/pendant pictured on the left is also available for Grandma and can have the tiny heart dangles added for her children or grandchildren (up to 7). Click here to view this selection. Every day can be Mother's Day! 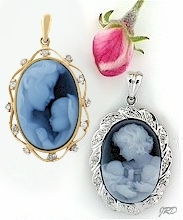 Beautiful cameo pendants expressing love and family bonds. Some designs come as pin/pendant combinations. Click here to view this selection.